President Woodrow Wilson had a strong Christian upbringing that he carried throughout his life. We know that he had the first Christmas tree put up and decorated in the White House when he was President of the United States. The President and his family can be pictured spending their first Christmas in the White House with Christmas presents and all the trimmings. Wilson was accustomed to having gatherings with the attendance of many intellectuals and family. As President he also wanted to have a national Christmas tree lighting ceremony and in 1913, the first year the president was in office, he was able to have a celebration with a Christmas tree lighting ceremony on Christmas Eve at the Capital. President Wilson had a great love for writing and published quite a collection of works. The history of his presidency does not indicate whether he sent and received Christmas cards. The facts are that during this era sending Christmas cards was very much in vogue. Since President Wilson was a progressive man with an impressive writing ability and the wish to establish traditions, we can presume that this would carry over to sending Christmas cards, although, there is no evidence of this. Thomas Woodrow Wilson was born Christmas week, December 28, 1856 in Staunton Virginia. His father, Joseph Ruggles Wilson, was a minister at the First Presbyterian Church in Staunton, Virginia. His mother, Janet, was born in Carlisle, England to a Scottish Presbyterian minister, Thomas Woodrow. Tommy – as his family called him –had two older sisters, Marion and Anne, and a younger brother, Joseph Ruggles. It is possible that Wilson’s mother had sent a note in a Christmas card announcing the coming birth. When Wilson was a year old the family moved to Augusta, Georgia. He did not attend school until he was 13, but was taught at home by his father. Wilson and his father developed a close relationship during his early schooling. They often went to various businesses, such as the mill, foundry, and ammunition plant to see how they operated. His father taught him to look up words and how to write simply, expressing what he meant clearly. This helped to develop his skill as a speaker. Listening to his father’s sermons and Christmas homilies would have sharpened his desire to be a speaker. Wilson entered Davidson College in 1873. He was not prepared for college and after one term he left North Carolina when he broke down from being overworked. He continued studying on his own at home for 18 months until he entered the College of New Jersey, which later became known as Princeton. It was during these college years that he developed a self confidence that never left him. He studied public speaking and was very active in the debating society. 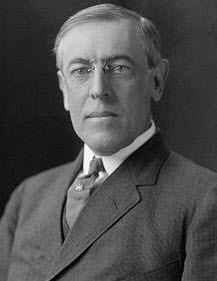 Although it isn’t known if Wilson wrote out Christmas Cards that year, he wrote an essay entitled “Cabinet Government in the United States,” a brilliant piece of writing which he signed Woodrow Wilson. After graduation in 1879, he entered the University of Virginia to study law. He received his law degree in 1882, moved to Atlanta, and entered the partnership, Renick and Wilson, where he struggled to build a practice. He realized that he would never make a successful lawyer and returned to studying history at Johns Hopkins University. He refused to compete for the top marks or study anything that bored him. After being persuaded by friends that he would receive higher pay as a teacher with a doctorate, Wilson submitted a book in 1885 as his dissertation, “Congressional Government,” and received a Doctor of Philosophy degree. Wilson celebrated his 29th birthday Christmas week of 1885 with his new wife, Ellen Axson, whom he married in June. This was also the year he started his career as an educator. He was an associate professor of history at Bryn Mawr College (1885-1888), professor of history and political economy at Wesleyan University (1888-1890), and returned to the College of New Jersey as professor of jurisprudence and political economy in 1890. He remained at the College of New Jersey for the next 20 years, helping it grow into the Princeton University and serving as president of Princeton from 1902-1910. During Wilson’s years as an educator he wrote several books including, “The State” (1889), “Division and Reunion” (1893), “George Washington” (1896), “A History of the American People” (1902), and “Constitutional Government in the United States”(1908). He was sought after for his opinion and was in great demand as lecturer. Having learned the value of the written word from his father, Wilson wrote many essays, letters, book reviews, and undoubtedly Christmas cards during these years. While he was president of Princeton, Wilson launched many reforms with the intention of building a university that would produce leaders and statesmen. He wanted to establish a stronger graduate college, remove the upper-class eating clubs, and have undergraduates and graduates live together while being presided over by teachers and tutors. He believed they would benefit from mutual stimulation of scholarly ideals. He was able to add 47 preceptors (young scholars) to the faculty who supervised the development of small discussion groups and helped the students. He faced much opposition to eliminating the social clubs. Two alumni willed several million dollars to the graduate school on the condition that the goals of Wilson’s opponents be met and the clubs remain. Wilson was defeated. Woodrow and Ellen had three daughters – Margaret (born in 1886), Jessie (1887), and Eleanor (1889). His wife took care of the finances, oversaw the home and made sure that he had quiet for his working hours. Ellen took care of the entertaining with their association of intellectual friends and family throughout the year and during the Christmas season. Wilson was overworked during the 1890s and suffered sick spells, needing many hours of rest. Historians suspect that he may have suffered as many as two minor and one major stroke during this period. He was told that he must retire and lead a very quiet life in 1906. The battle that Wilson had endured during his presidency at Princeton received great publicity and brought his name into prominence throughout the state. He was elected as Governor of New Jersey in 1910, and true to his nature of independence, he took on the challenge of changing several items that created opposition for the public good. He went around the Democratic Party, appealing to the voters for support of his programs. He was able to create the Public Utility Control Act, Corrupt Political Practices Act, Worker’s Composition Act, and Direct Primary Act in just over a year in office. This brought Wilson to the national spotlight and the focus of the Democratic Party sometime around the Christmas Season of 1911. The Wilson family was not particularly happy to be moving to the White House, especially after lame duck President William Howard Taft said to them, “I will be glad to be going, this is the lonesomest place in the world.” First Lady Wilson was able to make a comfortable home as she always had. The President gave his daughter away shortly before the Christmas Season on November 26, 1913 to Francis B. Sayre. The White House also had its first Christmas tree that year, although it did not become a national tradition until Calvin Coolidge became president and First Lady Grace Coolidge gave permission to put a tree on the Ellipse. Wilson was sworn into office in March of 1913. Prior to the inauguration the 16th Amendment was ratified by most of the states, clearing the way for Wilson to enact a national income tax in his first year of office. The 17th Amendment was passed in April, transferring Senator selection from each state’s legislature to a popular vote by the state’s residents. The “new freedom” is what Wilson called his philosophy for government. He felt that the government should be more concerned about human rights. Early in his presidency, Wilson broke a long standing precedent and became the first to call the Congress into special session and addressed the two houses with progressive reforms. The Federal Reserve Act was one of the legislations passed in Congress and Wilson gladly signed it into law two days before Christmas. Wilson’s daughter, Eleanor, had the second White House wedding in less than a year than the first. She married William Gibbs McAdoo on May 7, 1914. The First Lady’s health began to falter early in 1914 and she passed away in August. Wilson was devastated by the loss and became more concentrated on passing through Congress much of the reforms he wanted to enact. He was determined to keep the United States out of the war that broke out in Europe with the assassination of Archduke Ferdinand. However, when several American sailors were arrested for accidentally crossing a restricted area, Wilson sent Marines to Mexico where they seized the port of Veracruz. War was averted with the mediation of Argentina, Brazil and Chile. With all the unsettlement of 1914, it is doubtful that a Christmas tree was set up in the White House. President Wilson became lonely and depressed without his wife’s companionship and was introduced to the beautiful widow, Mrs. Edith Bolling Galt, by his physician, Col. Cary Grayson. Edith Galt would write later of their courtship which the couple tried to keep private. The press wrote several negative articles, but Wilson paid no attention to the negativity and married Mrs. Galt in December of 1915. While not verifiable, undoubtedly the couple sent out announcements after the ceremony, perhaps in their Christmas cards. Pancho Villa of Mexico had expected the aid of the United States to help him achieve the presidency, but Wilson backed the government of Venustiano Carranza. Villa then started killing Americans in Mexico. Wilson refused to send in troops but stationed General Pershing in Texas to secure the border with Mexico. In January of 1916, Villa crossed the border into New Mexico and killed Americans on U.S. soil. When Wilson still did not send in troops, Villa’s band attacked the U.S. Cavalry stationed near Columbus, New Mexico. Wilson informed President Carranza that he was sending troops into northern Mexico. He advised Pershing that he could track down Villa but do nothing to upset the Carranza government. After many months, Pershing was directed to withdraw having failed to capture Pancho Villa. Wilson spent much of 1916 campaigning for the November election and working to stay out of the war in Europe. His campaign slogan was, “He kept us out of war.” During his fourth year in office he appointed the first Jewish Supreme Court Justice, Louis Brandeis. President Wilson signed into law the Adamson Act which provided railroad workers with an eight hour workday and paved the way for shortened workdays for all industrial workers. In October, avid baseball fan Wilson became the first sitting President to attend a World Series game. He was re-elected in November by a narrow margin. There is no indication of any Christmas cards, Christmas tree or other Christmas celebrations, but it is known that Wilson was actively trying to negotiate a peaceful settlement of the war. The German U-Boat menace became more dangerous throughout 1916 and into 1917, which prompted Wilson to call for a joint session of Congress on April 2, 1917. He read, “The present German submarine warfare against commerce is warfare against mankind. It is a war against all nations… We are accepting this challenge… The world must be made safe for democracy.” Congress deliberated for several days and declared war on April 6, 1917. This became known as the Great War, The War to End all Wars, and finally World War I. President Wilson was given full power over the price, production, and distribution of food and fuel supplies in August of 1917. The day after Christmas Wilson’s government took over the American Railroad systems and disrupted the Christmas travelers. The build up of troops in America continued as Russia was negotiating a separate peace with Germany. President Wilson tried to steer the war towards a peaceful settlement. In January he announced to Congress his 14 point plan. He said this would be the basis for peace and prevent future wars. Wilson believed so strongly in his plan he led the delegation of Americans to Paris peace talks, against the advice of people close to him. He was the first President to travel overseas while in office. He arrived in Europe on December 13, 1918 to great crowds of people shouting his name. Whether or not he was able to send his Christmas cards before leaving, being a prolific writer he probably sent many letters to his family and friends. After much discussion, peace was decided with the Versailles Treaty in June 1919, which contained many of Wilson’s ideas. This included the constitution for a League of Nations. Having returned to the U.S., Wilson addressed a hostile republican Senate and refused to back down on the U.S. joining a league of nations. He decided to take his plan to the general public as he had done when Governor of New Jersey. While on this nationwide trip, Wilson collapsed in Pueblo, Colorado from a stroke, leaving him paralyzed. His wife, Edith, and his doctor were the only ones to see him for a month. Any government business needing a signature was signed by his wife guiding his hand. He refused to turn the reins over to Vice President Thomas R. Marshall. Wilson remained the active President and he made his decisions on the basis of digests that Edith had prepared. Wilson was unable to help the democratic candidate campaign in 1920, and James M. Cox lost to Republican Warren G. Harding. President Wilson left office disappointed that the League of Nations was not embraced by Congress, but he believed strongly that the United States would eventually join with other nations and lead the world community. He would not live to see the United Nations established during Harry S. Truman’s presidency. Woodrow Wilson died February 13, 1924 and was laid to rest in the National Cathedral of St. Peter and St. Paul in Washington, D.C. He is the only President to be buried in the nation’s capital. He was the first President to have a PhD, the first to attend a World Series, the first to want a national Christmas tree, and the first to travel overseas during his time in office. His legacy includes tariff reform, income tax, currency and credit reform, regulation of business, and better working conditions for the working masses. He left behind a legacy of domestic reforms, a revised and stabilized central government and broadly admired foreign policy.